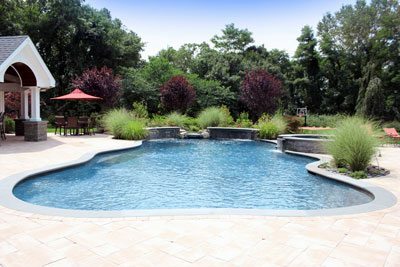 There are many types of pools that are used for various applications including steel wall, gunite, and fiberglass. Pool companies usually deal with one specific installation and may not consider all the factors involved for your property. Being designers and installers, we look at your property as a whole. We will determine the type of pool necessary based on your exact site conditions and the many factors involved. We also think about the location of your pool and how it relates to the rest of your property. What hours will you be using your pool the most? What direction does the sun rise and set over your backyard? Will you be including any water features? How many people do you normally entertain? Where can we install the pool equipment so it is in the least visible area? All these factors will be discussed and taken into account when designing and installing your pool.